Petition - Ban Assault Weapons and High Capacity Magazines Now! PETITION BACKGROUND: Thoughts and prayers are not enough. Americans deserve a strong response from our elected leaders. 290+ gun violence prevention groups, chapters and allies have joined the Campaign Against Assault Weapons to ban #WeaponsOfWar to keep our families and communities safe. We invite you to join our campaign by signing our petition. Too many Americans are being senselessly gunned down in public spaces in towns and cities across the nation. With easy access to military-style assault weapons and high capacity magazines, too many individuals have turned our schools, malls, concerts, movie theaters, and places of worship into a war zone filled with terror, devastation and terrible loss. Congress did not take action after Aurora, Sandy Hook, Orlando, Las Vegas, Sutherland Springs, Parkland, Pittsburgh and many other devastating mass shooting incidents and the scope of death and destruction caused by a man with weapons of war is growing. Your thoughts and prayers are not enough. We demand that you act now to stop the carnage with an effective ban on the civilian use of these weapons. NOW is the time to act! After the deadly mass shootings in Sandy Hook, Orlando, Las Vegas, Sutherland Springs, Parkland and Pittsburgh, we are saying enough to #WeaponsOfWar! Join a broad coalition of 293 organizations, chapters and allies on a #CampaignAgainstAssaultWeapons. 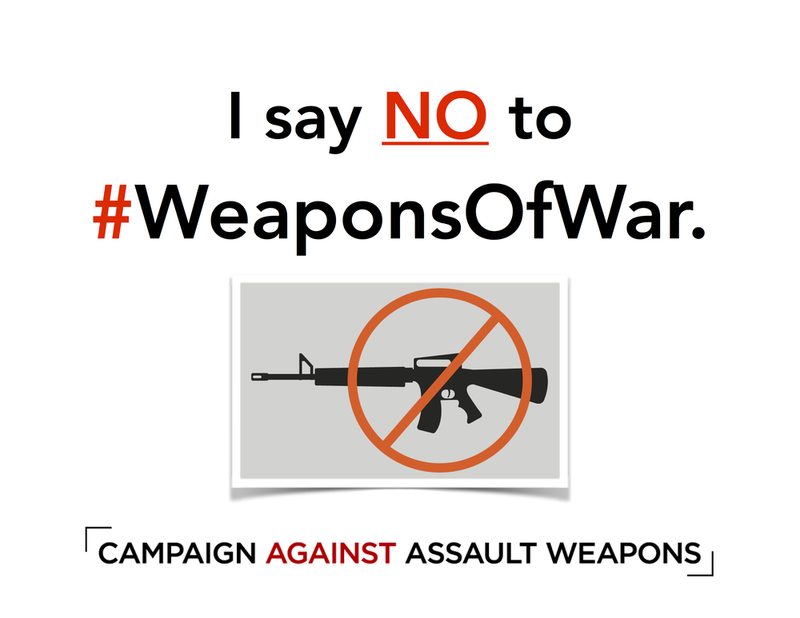 Please say NO to #WeaponsOfWar by signing our petition to ask Donald Trump and the Members of 116th Congress to pass a civilian ban on assault weapons and high capacity magazines. Click HERE for more information on assault weapons from the Violence Policy Center. SENATE: Senator Diane Feinstein introduced the Assault Weapons Ban 2019 legislation on January 9, 2019. Click HERE to review the legislation. HOUSE OF REPRESENTATIVES: Representative David Cicilline is expected to introduce the companion bill in February. His Assault Weapons Ban legislation for the 115th Congress can be viewed HERE. Senator Diane Feinstein has also created THIS RESOURCE GUIDE on an Assault Weapons Ban of 2018.